Leading forklift supplier Lencrow Materials Handling now offers both Lowry and Liftking products in Australia. Leading Australian forklift supplier now stocks Lowry forklifts, specially designed to work in confined spaces. Designed to work in confined spaces, Lowry forklifts are built by the Canadian-based Manitex Liftking Group, also known for its rough terrain Liftking vehicles. While the Lowry offers lifting capacities of 11000 to 23000 kilograms, they are all less than 1500mm wide. In addition, Lowry forklifts all come with electronically controlled Dana three-speed transmission and the choice of LPG or diesel engines. 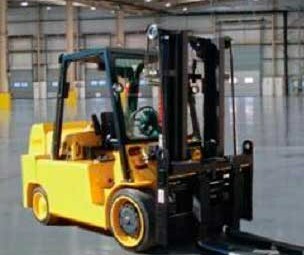 Lowry forklifts are all fitted with cushion tyres to ensure maximum stability for foot print. They are suited to many manufacturing applications where both size and large lift capacity is required. "These units are also ideal for the machinery relocation industry where a forklift with muscle is necessary to get equipment out of sites with limited space," says Lencrow General Manager Ross Grassick. "We've been looking to offer a range of equipment with a build to requirement option for some time. "Lowry provides the ability to custom build masts and carriages for each application such as container entry or other special needs." The Lowry range all offers wide view mast and wet brakes in all models. Liftking International Sales Manager Mark Aldrovandi adds Lowry machines are proving reliable in customers' US and Canadian facilities. "We've put a lot of effort into making these units driver friendly while still offering robust design," he says.